New York City, 19th March 2018 – Domus Semo Sancus (DSS) today announced the release of its “Visualize Connections for ICIJ Databases” link analysis graphing tool. The International Consortium of Investigative Journalists (ICIJ) is a global network of investigative journalists and media organizations who focus “…on issues that do not stop at national frontiers: cross-border crime, corruption, and the accountability of power.” Their databases contain information on more than 785,000 entities that are part of the Panama Papers, the Offshore Leaks, the Bahamas Leaks, and the Paradise Papers investigations. The data covers nearly 80 years up to 2016 with links to people and companies in more than 200 countries and territories. Visualize Connections for ICIJ Databases is a customized version of Visualize Connections, DSS’ cognitive link analysis tool that can graphically display relationships between entities found within structured and unstructured data. It can graph the data within the ICIJ Databases within seconds, and with “one click”, while not requiring the end-user to download the data or install the application. Visualize Connections for ICIJ Databases is fully integrated with SafetyNet.ai, DSS’ award-winning Enhanced Due Diligence (EDD) cognitive search tool. Through this integration, end-users can quickly and seamlessly cross-reference data from within the ICIJ databases with internal files or data found on the internet. During a SafetyNet search, it scans global sanctions lists, Politically Exposed Persons (PEPs) lists, and Persons In Public Life (PIPs) lists; and utilizing Artificial Intelligence tools from IBM Watson, Amazon, Google, and Microsoft, along with custom proprietary code; it conducts multilingual scans across the Internet (surface web, deep web, and dark web). Some of the datasets that SafetyNet searches are: court cases, criminal registries, government records, curated news sources, image files, and more. Visualize Connections for ICIJ Databases is available free of charge to all subscribers to SafetyNet’s EDD (or higher) plans. 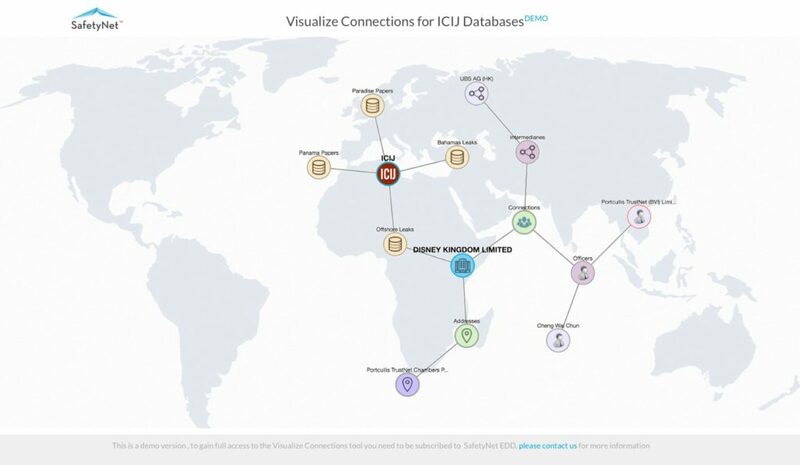 A live demo of Visualize Connections for ICIJ Databases can be found at www.safetynet.ai or safetynet.ai/vc4icij_demo/. New York City, 8th December 2017 – The Financial Conduct Authority (FCA), the conduct regulator for over 56,000 financial services firms and financial markets in the UK, recently hosted a gathering of financial regulators, financial institutions, and FinTech firms to discuss “FinTech Innovation in Anti-money Laundering & Digital ID”. The goal for FinTech Innovate, which took place in London from 5 – 6 December 2017, was to “encourage innovation in the interest of consumers”. Domus Semo Sancus (DSS) was one of the FinTech firms that got an invitation to the gathering, and it was represented by its Chairman and CEO, E. Jay Saunders, and Head of Technical Development, Rohit Trivedi. During the two day gathering, attendees discussed how to promote innovation within current AML requirements, combining data protection with AML innovation, unlocking new technologies in AML compliance, transaction monitoring technology, AML and digital ID considerations in Open Banking, and the FCA’s Regulatory Sandbox. Domus Semo Sancus (DSS) Ltd,founded by E. Jay Saunders in November 2014, is a financial technology company that is building tools to encourage financial inclusion and bridge the e-commerce divide. New York City, 29th November 2017 – Domus Semo Sancus’ (DSS) SafetyNet Safe City, the version of its award winning Enhanced Due Diligence Cognitive Search and Crime Prevention Tool SafetyNet, designed specifically to help law enforcement proactively address and prevent crimes, today got upgraded with a number of advanced new capabilities. The new features are primarily a result of recent upgrades being made to the underlying image recognition and analysis engines that powers SafetyNet Safe City’s Facial Search tool. Locate, identify, and track persons within real-time video, even if their faces are not visible throughout the video or even if they go in and out of the field of view. SafetyNet Safe City Facial Search tool gives law enforcement the ability to easily and quickly identify multiple persons-of-interest against a collection of millions of facial images from its ever growing high risk database in near real-time. In addition, law enforcement personnel utilizing SafetyNet Safe City can now have it automatically recognize text (such as street signs and license plates) from within images, including video images, and perform specific actions based on what the text says. SafetyNet Safe City’s upgraded Facial Search engine is over 500% faster with the power to support more than a 1,000% increase in the number of facial images that can be searched. Rohit Trivedi, DSS’ Head of Technical Development, commenting on SafetyNet Safe City’s new capabilities stated that “the new features that we’ve made available today provides the law enforcement community with the latest and greatest in machine learning and visual analysis, thereby allowing them to minimize the time between the detection of a crime and the solving of it.” As SafetyNet Safe City is cloud-based, there is no action required on end-users’ part to access the new features, as all SafetyNet Safe City’s customers will be automatically upgraded for free. “We want to ensure that our law enforcement customers are able to focus on the things that matter – i.e. solving crimes and saving lives – and that’s why we’ve worked hard to make these enhancements available free of charge and without the requirement for an IT department to roll them out.” states E. Jay Saunders, Chairman and CEO of DSS. New York City, 12th November 2017 – Domus Semo Sancus (DSS), a financial technology startup created by E. Jay Saunders, will be featured at the upcoming RegTech Summit for Capital Markets – New York City, which will take place on the 16th November 2017. Headline speakers for the event include Thomas Dunlap, Managing Director, Goldman Sachs and Julia Bardmesser, Global Head of Data Integration, Deutsche Bank. During the summit, DSS’ Chairman and CEO, E. Jay Saunders will join John Sproat, Global Head of Client Data, RBC Capital Markets, and Charles Minutella, Business Development Manager – KYC, Thomson Reuters, on stage to discuss the topic “Applying innovative technologies to manage risk and improve onboarding, KYC and AML”. The RegTech Awards have been designed to acknowledge those companies who are creatively finding solutions to help with regulatory challenges. Other nominees for the 2017 RegTech Awards include industry veterans Accenture, BearingPoint, Bloomberg, Deloitte, IBM, KPMG, LexisNexis, Oracle, PWC, and Thomson Reuters. New York City, 10th October 2017 – Domus Semo Sancus (DSS), a financial technology startup created by E. Jay Saunders, will be part of Startup City at the prestigious Money20/20 conference being held from October 22-25, 2017 in Las Vegas, Nevada. Representing DSS at Money20/20 will be Chairman & CEO, E. Jay Saunders and Head of Technical Development, Rohit Trivedi. “We are very thankful to the organizers of Money20/20 for inviting DSS to be part of Startup City. It gives us a tremendous opportunity to showcase SafetyNet, our enhanced due diligence cognitive search tool, to the main players in the global payments industry.” stated Saunders. “If you’re attending the Money20/20 conference in Las Vegas, I encourage you to join us at booth S50 to find out how SafetyNet.ai is playing a role in the future of money” he further commented. Performing at Money20/20’s Industry Night, which will take place at the Omnia Nightclub, is 3x Grammy Award-winning performer Ne-Yo. New York City, 28th September 2017 – Domus Semo Sancus (DSS), a financial technology startup created by E. Jay Saunders, has been nominated for 4 A-Team 2017 RegTech (Regulatory Technology) awards for its Enhanced Due Diligence Cognitive Search and Crime Prevention Tool SafetyNet.ai (www.safetynet.ai). The RegTech Awards have been designed to acknowledge those companies who are creatively finding solutions to help with regulatory challenges. DSS is the only company from the Caribbean that was nominated, and one of only a few companies with multiple nominations. The awards ceremony will take place in New York City on the 16th November 2017 during the RegTech Summit for Capital Markets. Headline speakers for the event include Thomas Dunlap, Managing Director, Goldman Sachs and Julia Bardmesser, Global Head of Data Integration, Deutsche Bank. E. Jay Saunders, Chairman and CEO, DSS will demo SafetyNet.ai at the summit during the RegTech Showcase event and he will also form part of the panel discussing the topic “Applying innovative technologies to manage risk and improve onboarding, KYC and AML”. Other nominees for the 2017 RegTech Awards include industry veterans Accenture, BearingPoint, Bloomberg, Deloitte, IBM, KPMG, LexisNexis, Oracle, PWC, and Thomson Reuters. “The industry that our clients operate in is ever changing and the risks for them are high.” stated E. Jay. “Our clients put a lot of faith and trust in us, and that’s why we spend a lot of time and effort to ensure that SafetyNet can help them mitigate risk at a local and global level. To have SafetyNet recognized by the A-Team is a great honor.” he further commented. To vote in the 2017 RegTech Awards go to http://datamanagementreview.com/awards. Voting closes 4th October 2017. Domus Semo Sancus (DSS) Ltd, founded by E. Jay Saunders, is a financial technology company that is building tools to encourage financial inclusion and bridge the e-commerce divide. SafetyNet.ai is DSS’ award winning enhanced due diligence (EDD) cognitive search and crime prevention tool. It helps companies comply with K.Y.C and A.M.L. rules and regulations by harnessing the combined artificial intelligence power of IBM Watson, Amazon, Google, and Microsoft, to help companies spot and mitigate against risks before they become threats. SafetyNet.ai is cloud based and is offered in the following subscriptions: Lite, EDD (Enhanced Due Diligence), EDD Enterprise, Safe City, and Developer. SafetyNet utility software has been nominated for an OCTA Innovation BIC Award. Mr. E. Jay Saunders is the founder of Domus Semo Sancus Ltd. (DSS) a FinTech company from TCI which recently launched SafetyNet a revolutionary Know Your Customer (KYC) and enhanced Customer Due Diligence (CDD) on-boarding utility. SafetyNet gives end-users a quick and cost-effective way to conduct thorough background checks on associates and persons of interest at a global level. With a single search, it can sift through hundreds of millions of data points (e.g. court records, breaking news, social media sites etc.) culled from the internet at large in real time to expose: patterns, connections, and insights around persons and entities-of-interest at a global level, and at a depth and speed no human expert can ever achieve on their own. This software is being used in a number of Caribbean OCTs including Cayman Islands, Curaçao, Montserrat and of course Turks and Caicos Islands.